Welcome to the latest edition of Your powergrid, our regular e-bulletin for everyone who has an interest in how we are delivering power to all homes and businesses in the Northeast, Yorkshire and northern Lincolnshire. Whether you’re from a community or special interest group, local or central government, an energy supplier, a local business, an investor or one of the many people who are interested in what we do; through this bulletin we aim to keep you informed about our plans for the future and the issues you are interested in. The future’s green: Northern Powergrid engineers install equipment near Hexham which will monitor the impact of heat pumps on the network as part of a major low carbon project. The latest topic for discussion is the low carbon economy. We are at the forefront of a £54 million project called the Customer-Led Network Revolution (CLNR) where we are investigating smarter ways of running the network, responding to customer needs in real time and exploring how we can give customers more flexibility in the way they use and generate electricity. The CLNR project places you, the customer, at the heart of the smart grid. We recognise that our customers have choices and that, if we do not fully take account of your concerns, and have your interests front of mind, the opportunity to cost effectively deliver the low carbon economy will be missed. Have Your Say features a video on the CLNR project, a related case study and there’s a quick poll. You can also give a fuller comment on our business proposals. You may be interested in other issues and Have Your Say also features Distributed Generation and getting connected to the network and our Priority Services Register. We’ll be regularly adding other topics and you’ll be able to comment on all, or any, of them. Don’t forget we’ve launched a new area of our online community to make it easy as possible for you to let us know what you think of our plans and in the last bulletin we sent you a unique username and password so you could join in straight away and let us know what you think. And by using the links below you can choose to give feedback on the issues that interest you the most or you can simply tell us what you think about our business as a whole. We attended the Independent Economic Review conference in Newcastle on 15 February which was organised by the North East LEP (NELEP). The review is being chaired by Labour Peer, Lord Andrew Adonis. Click here for more information. 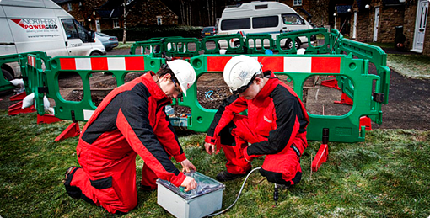 We’ve joined forces with the British Red Cross and are working together to make sure customers who suffer power cuts are cared for until their electricity supplies are restored. Click to find out more. To give you every opportunity to influence our plans throughout February and March we’ll be sending this e-bulletin fortnightly. We have put together a short survey so you can tell us about how you want to communicate with us and how well you think we’re doing in making this happen. So why not share your thoughts? Keep up to date with hot topics. As well as our future plans you can read about our day-to-day activities through the news section of our website. Right now you can check out the new video on how to deal with interruptions to power supplies. We are considering this in the development of our detailed business plan.